12 Days of Gluten-Free Christmas Cookies! 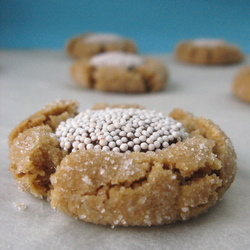 Get ready for some amazing gluten-free cookies for this holiday season! Maggie, over at She Let Them Eat Cake is organizing a fantastic event that will make Christmas cookie swaps, parties, and school festivities so much easier for you this year! For 12 days, starting December 1st, a different gluten-free blogger will share a favorite cookie recipe with you each day. And on the last day, December 12th, Maggie will host a link-up for us all, so you too can join in and share your favorite gluten-free Christmas cookie with everyone! The linky will be open until midnight EST December 12th. So get your gluten-free cookie recipe ready, and if you need a little help, be sure to check out 12 Days of Gluten-Free Christmas Cookies for ideas! And we’ve got fantastic give-aways! Jen, from Gluten-Free Life with Jen and the mastermind behind the Gluten-Free Allergy-Free Expo is donating a 2-day pass worth $350. Of course you’ll have to get to Chicago and arrange for your own hotel. We also have some cookbook give-aways in the works…more on that soon. And here’s a sneak peek at what you’ll be seeing from me on December 4th. Be sure to come back for the recipe! 5 Responses to 12 Days of Gluten-Free Christmas Cookies! I just love this picture Deanna! Such a great angle! I’m so excited about the event and I’m so glad that you’re co-hosting! Just added you to The Crispy Cook list of 100+ GF blogs. You can see your entry on the link on the right hand side of my blog. Have a lovely Thanksgiving!